Sensei's Library provided Go community service providers with the ability to be profiled through SL by means of including a randomly selected picture from the pool of providers and displaying the picture advertisement on the left hand yellow bar of its pages. 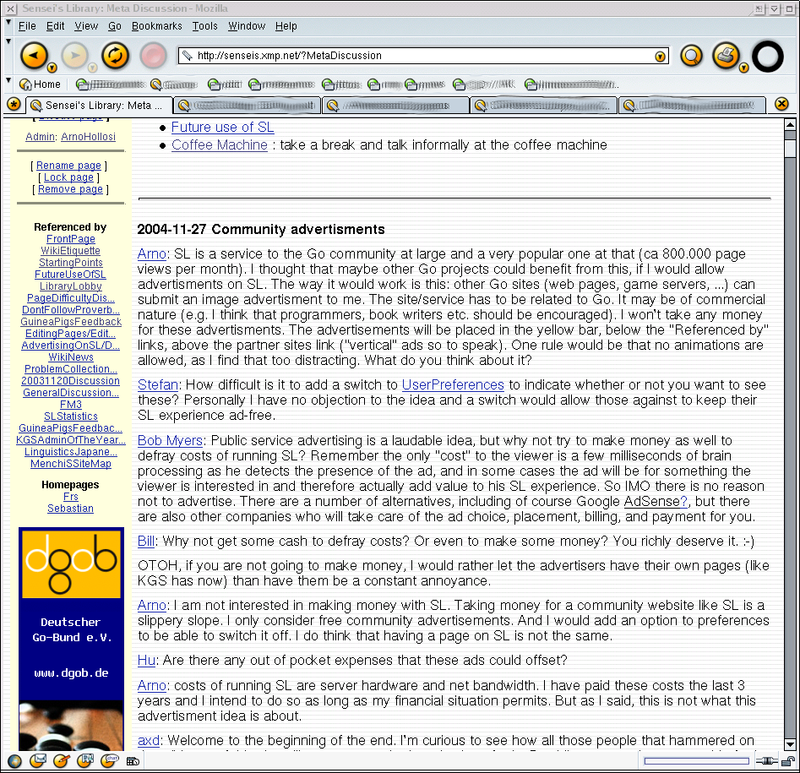 Here is a mock-up of an SL page with a picture: http://senseis.xmp.net/files/sl-ads-mockup.png. Here is an overview of the Go community service providers which are profiled through SL. If you are a Go community service provider and you would like your picture advertisement to be featured on SL, please contact Arno or Morten (see template below). You must provide a service to the Go community. No unrelated pages are accepted. Up to five pictures per provider can be profiled through SL. A picture must not be larger than 120 pixels wide by 400 pixels high. The picture must not be larger than 15KB. Acceptable formats are GIF, PNG, JPG. The SL admins may decide not to accept certain pictures and/or providers, and although you are free to discuss this with them, their decision is final. Registered SL users will be able to select not to be presented with the profiled pictures. SL accepts no responsibility nor does it provide any warranty for the placement, visibility or randomness of pictures shown on the normal SL pages. : the random function makes sure each provider gets the same share of views, i.e. five pictures don't give you five time as much views as one picture.